Preheat oven to 375 F. Spray a mini muffin pan with cooking spray. Cook the pasta according to the package instructions. Aim for a softer texture rather than a firmer texture, since they will dry out slightly in the oven. Drain the pasta. Toss with cheese and egg until all of the strands of pasta are well coated. Divide the pasta between 24 mini muffin cups. 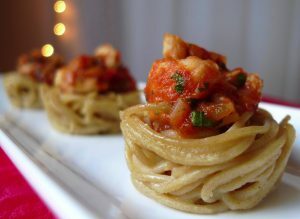 Arrange the pasta strands in the muffin cups so they cover the bottom of each and form cuplike shapes. Bake for about 7 minutes, or until the egg is set. Cool slightly, and then remove the pasta cups carefully from the pan. These can be made the day ahead and refrigerated in an airtight container. Gently warm the cups for a few seconds in the microwave before filling and serving. Preheat a medium sauté pan over medium high heat. Add the oil, and allow it get hot and shimmering. Then add the shallot, and cook until translucent. Next, add the red pepper flakes, garlic, and oregano. Cook until just fragrant, about 30 seconds. Add the wine, and bring to a boil. Scrape any fond from the bottom of the pan. Then add the tomatoes. Cook until the mixture reduces and thickens to your liking. Season with salt and black pepper. Add the lobster meat to the tomato mixture, and cook until it is just heated through. Turn off the heat, and stir in the parsley and basil. 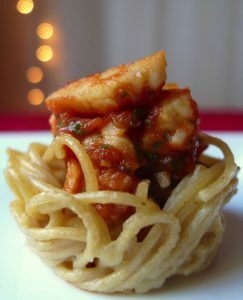 Spoon a little of the lobster/tomato mixture into each pasta cup. Serve immediately. Looks very good I will have to try this thank you.